With the advent of the internet, software companies have also flourished. This makes website development and design companies as two of the most lucrative businesses to date. Hence, this leads both web developers and designers to create a WordPress template for software company. This enables them to step up their game and dominate the web development and design niche. There is quite a thread that separates designers from developers. Yet, these two areas have one common ground, and that is artistry. Web development is a meticulous web building process driven by precision in which the finished output is considered an art form. Web design is a set of disciplines for the maintenance of the website. Moreover, web designing has several areas. These include website interface, user experience, and graphics. Needless to say, both areas play a significant role in the success of a software website. In fact, many web developers and designers agree that the two fields are interrelated. One cannot function with the absence of the other. If you want to showcase your design and web or app development skills online, this collection of software WordPress templates is your answered prayer. Purchasing a WordPress software theme that is professional, efficient, and creative is a surefire way to let your target audience acknowledge your services or skills. However, because myriads of themes are being advertised online, it is quite easy to get confused which one to buy. Luckily for you, we’ve made the effort of listing down top ten software WordPress templates that are designed for web development and design companies. Let’s take a closer look at these ten WordPress themes! There is no other event landing theme that beats the efficiency and seamless design of Codathon. This WordPress theme is created solely for hackathon events and projects. It features a stylish yet clean design that is perfect for your event presentation. Your target visitors will not have a hard time getting the message of your content. It has an efficient slider which makes your event presentation an organized one. It also has Cherry plugins that allow you to spice up your website without affecting the overall functionality. Also, it has content modules. This feature allows you to add different content types to your page. You can add buttons, sliders, images, audios, and much more. You can add any content that will help your visitors navigate through your event presentation in a breeze. If you are still unconvinced why this software WordPress template is a great buy, then its additional features will do. It is well-documented, SEO optimized, and has a drag-and-drop Power Page Builder. 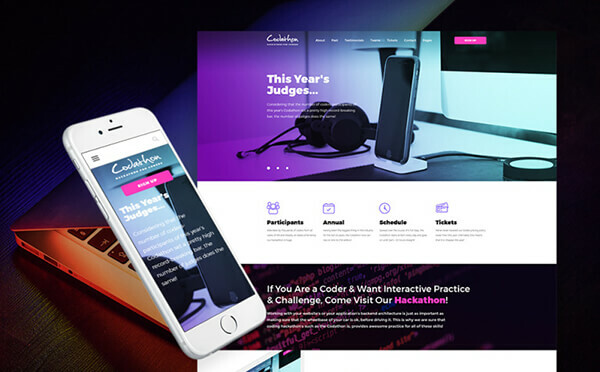 Surely, you cannot find any better Hackathon landing WordPress theme than Codathon! Are you into web design business? No worries! This web design studio WordPress theme has got you covered. Created by the top leaders in the web development and design niche, this TemplateMonster’s WordPress theme is 100% responsive and editable. Supported with a flexible Power Page Builder, you can configure and customize the design of your theme in an instant. As far as website aesthetics is concerned, this theme offers you more layout options. You can try and experiment different layouts and save your favorites in its built-in library. Moreover, since visuals are an important aspect of the design business, having a TM photo gallery plug-in is a must-have solution that you would want in your template. This versatile solution has multiple settings which allow you to create and configure your galleries in just a single click. 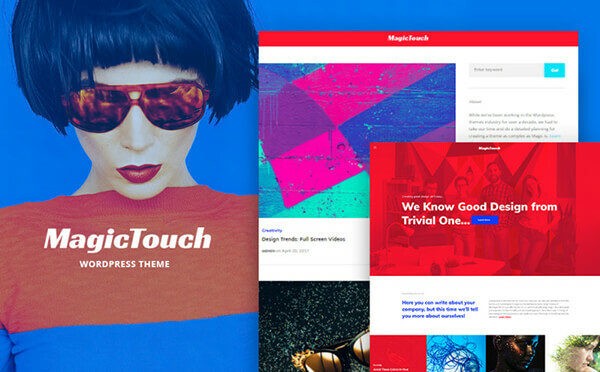 Because attractive design alone will not drive more traffic to your site, this MagicTouch is also packed with powerful features. Advanced custom widgets and Cherry plug-ins give your website a top-notch functionality. With well-structured and SEO-friendly codes, you can secure your place on top of Google’s search results. Lastly, MagicTouch is Ecwid-ready, which means you can set up your online store to promote your design even better. 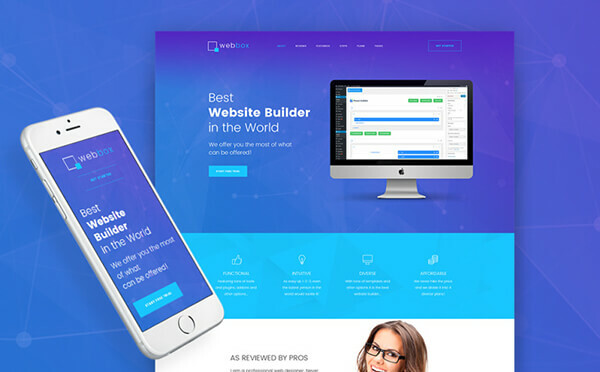 Webbox is a fast and refreshing landing WordPress theme. This multi-purpose theme can be used to present whatever products you have on the web. It has a trendy design and various features to help you showcase your services like no other. With its customizable template, achieving functionality is a straightforward and effortless process. You do not have to tinker on the codes just to configure the design. All thanks to its flexible Power Page Builder, you can now tweak and change your template without touching a single code. Webbox also includes seven pre-configured header layouts for you to choose from. Each layout has its own distinct look and options. Crafted with care, this landing WordPress theme is 100% responsive and SEO-ready. If a professional software product landing theme is what you want, then Webbox is the one for you. With its flexible and editable features, you can change your design so that it fits your software products and services. Do you need a WordPress theme for software company? One that is developed and designed for your software services? You don’t have to search the internet because CodeBolt is the best in this niche. With very powerful features and impressive layout options, CodeBolt has proven to be worthy of your money. Multiple layout options, customizable Cherry plug-ins, and various content types can be added and configured depending on your business. For software companies, the theme’s flexibility is a great advantage to target your audience. To convince your audience and drive more traffic to your website, CodeBolt is made SEO-ready for your convenience. The optimized source codes and SEO-friendly pages make search engines like Google read your content correctly. This gives you a high chance of appearing on the first page of the search results. Furthermore, your software products and services are just within your customer’s reach. All thanks to Ecwid feature, you can now add an easy-to-access online store to your existing website. Thousands of blogs and websites are created every day. With myriads of competitions online, you need something that will set you apart from the rest. What better way to mark a website content than through a nice and professional photo branding technique, right? Branding has indeed become a necessity, especially among eCommerce websites. Hence, more and more eCommerce shops make use of photo editing applications to personalize their photos and other media content. If your business niche is about photo editing, then this software WordPress theme is for you. 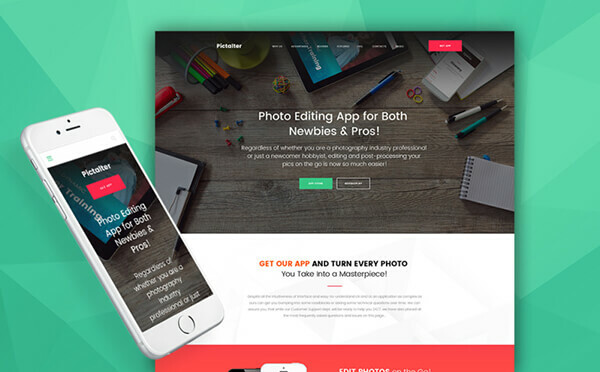 With a modern and trendy design, Pictalter will bring your photo editing mobile app business to greater heights. You don’t have to master any web development and web design skills to use this theme. It is a ready-to-use and easy-to-configure WordPress template that is coupled with reliable source codes. Aside from its stunning design, it also has varied customization features. This allows you to experiment with different layouts and website looks that are best suited for your target market. Are you having a hard time looking for the perfect theme for your WordPress based crowdfunding website? 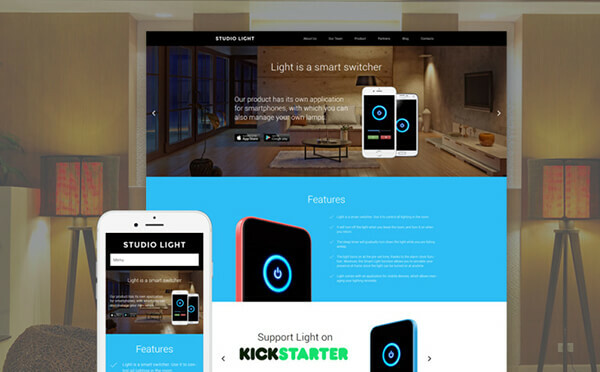 Let Studio Light show you how its powerful features empower your website. With a very versatile and 100% responsive design, this template is very much compatible whatever device you are using to open your website. What makes this theme a stand-out among other crowdfunding WordPress templates is its user-friendly interface packed with high-performing features. This includes valid semantic coding, Cherry Framework 4.0, MotoPress content editor, WPML, SEO-optimized pages. Users of this theme commend Studio Light for its flexibility. It allows them to tweak the design depending on their personal style and preference. 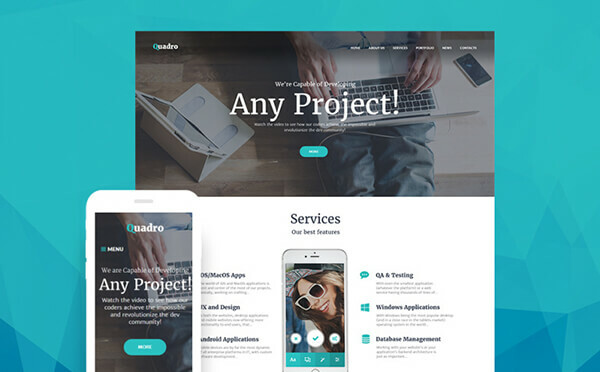 Quadro is a versatile and eye-catching software company WordPress theme. It comes with editable features for the website design and is backed with well-structured codes and SEO-friendly pages. Its wide range of elements and custom widgets offers you countless of ways to showcase your company creatively. Through its drag-and-drop Power Page Builder, you can create and design your website without changing a single code. It also enables you to make changes to the design without reloading the page every time. Thanks to its Live Customizer, you can adjust the design live as well. This WordPress software company theme does not have a shortage of incredible features. Quadro also allows you to build your business portfolio in the most creative and fastest way possible. Through its Cherry Projects, you can create, manage, and present your portfolio to your audience in the most efficient manner. 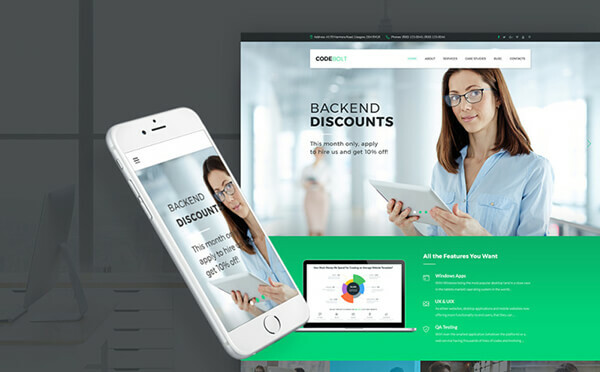 If you are an aspiring software and app developer who wants to build a powerful and flexible website, then Arimo is your best bet. This WordPress software template is packed with incredible features. These features will allow you to create your website with utmost functionality. Also, its customization features are easy-to-follow and well-documented. Hence, you can make the changes that best suit your target audience. Arimo is indeed a user-friendly WordPress theme. Thanks to its drag-and-drop page builder, you can personalize the design even without the master skills of a developer. With its more than 25 ready-to-use modules, you can make changes without touching the codes. Moreover, it has many layout options and content modules to give your website a unique style that only you can provide. Who says being unique takes a lot of cash? Arimo proves to be the best value option when it comes to showcasing various layouts and design at a very reasonable price. The Cherry Projects ensures you will have myriads of options to present your services online. 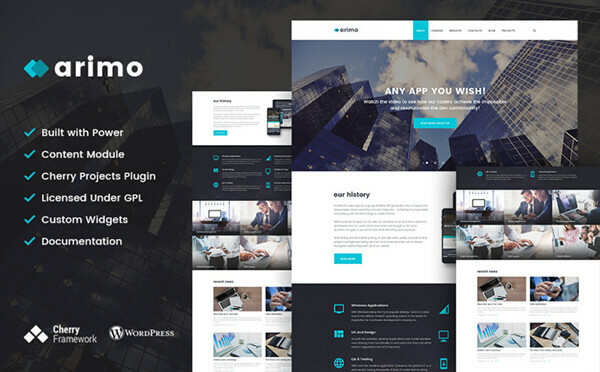 With bonus features of SEO-friendly codes and 24/7 technical support, Arimo is a software and app development WordPress theme that you should not miss. Does your interest have something to do with music? Do you want to build a website that can showcase how your music app works? The internet is the best place to introduce your work portfolio to millions of potential customers around the globe. Tune Station is a theme dedicated to music app sites. Purchasing this theme means you get to enjoy large photos, logo, and call-to-action (CTA) buttons. It has a user-friendly drop-down menu. This allows you to organize all your contents into sub categories. Thus, it gives your website a clean and easy-to-navigate interface. 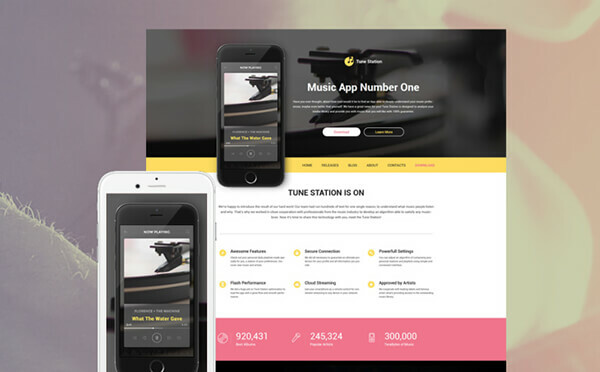 This Tune Station WordPress theme is also responsive. It also provides you trendy website effect options such as lazy load and parallax effects. 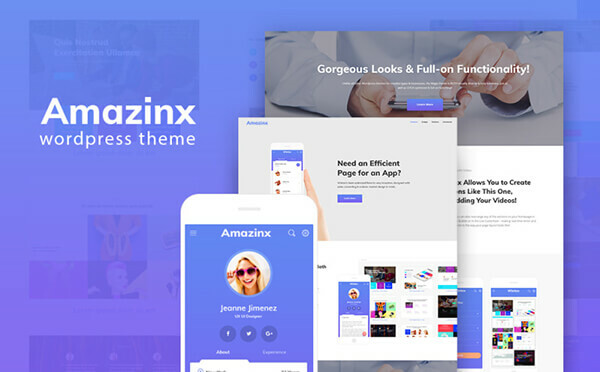 Amazinx is a landing WordPress software company theme for mobile app presentations. With a 100% responsive design and cross-browser compatibility, Amazinx is a well-loved theme by many mobile app developers. The different content modules will cater to whatever content type you want to add to your website. Amazinx also offers you a codeless web building and customization process. All thanks to its reliable drag-and-drop Power Page Builder. With 24/7 FREE technical support, the assistance team will help you solve the installation and technical problems. They are available round the clock and absolutely for free. TemplateMonster also made sure to include an Ecwid-ready feature. Now, you can add your online shop from your existing landing site. This theme is a must-have for your mobile app presentation landing page. Planning to build a website is the easy part. Putting the plan into action is where the challenges begin. With the help of the best software WordPress template, you can help increase the success rate of your website. Not having enough money for high-quality theme should never be an excuse. Each WordPress software template on this list is available at very reasonable prices. All with impressive features that can help you boost your website in no time. For your software, web development, and web design website, refer to these WordPress templates and see which one suits you best. Do you have a hard time deciding which one will work for your site? Send us a message, and we will gladly entertain all your queries.